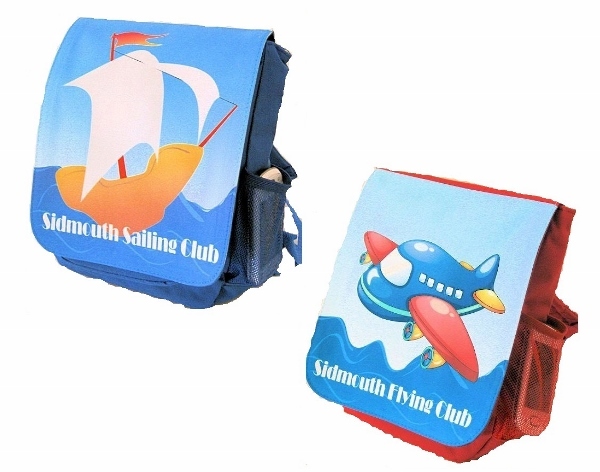 Small canvas children's rucksack with zipped top available in red or blue with a detachable bag flap for your own design picture and/or text for your full colour print. The overall size is 28 cms x 24 cms and the imprintable front flap 20.5 x 24.5 cm. The bag has an assortment of internal zipped pockets and two external mesh pouches. The entire front flap is ready to be personalised by you! Personalise with a full colour photo/picture of your choice and add text if required. If you choose to have text we have a selection of fonts for you to choose from. There is no limit on the amount of characters you can have but please remember the more you have the smaller the font size will be if it is to fit over a photo, please make sure there is room on the photo for the text to fit.